Whether youre planning a big group vacation, a family reunion or simply itching for a weekend away with friends, we have the property for you. We want to provide a comfortable and memorable experience for your group gathering. Our properties are the best vacation rentals for large groups because of their sizes, amenities and locations. At Red River Real Estate, we offer properties that are each designed to be a home away from home. These large family vacation rentals have ample space, allowing everyone plenty of room to relax and enjoy. Many of these homes have multiple floors and all have substantial-sized rooms. There are common areas with plenty of seating for you and your group. Our large group vacation rentals all have extensive kitchen space with adequate tables and chairs to accommodate your party. Several of our properties have large garages that can fit the cars of all of your vacationers. Considering a wedding in the mountains? Plan your wedding with us in Red River! Our weekend rentals for large groups can accommodate your wedding party for an extra-special getaway that will make your big day unforgettable. For more than 35 years, weve used our local expertise and service skills to ensure that you get the most out of your vacation stay. Our complimentary airport shuttle, concierge services and delicious breakfasts are only a few ways we take your vacation satisfaction to the next level. We equip our vacation homes for large groups with all the necessities to satisfy every member of your party. Book your group trip with us today to experience the difference Red River Real Estate can make for your getaway. Red River is a small town in the mountainous region of north central New Mexico. Its vast landscapes of mountains, streams and rivers make for a beautiful and fun vacation location. Embrace your inner adventurer with all the winter activities the area provides, such as skiing, snowboarding, snowmobiling and more. In the summer, raft on the river or hike and bike along the streams. If you are looking for a more laid-back vacation, Red River offers that, too. Fish along the many streams or simply enjoy the scenic destination by dining with a mountainside view at any of the many restaurants in town. Whether for a quick weekend escape or an extended family vacation, there is a memorable experience awaiting any type of traveler in Red River. Contact a member of the Red River Real Estate reservations team with booking questions or start your search today with our large group properties listed below! 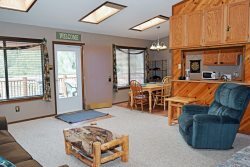 Running Bear River Lodge -PET FRIENDLY- 9 Bedroom Home, In Town, On The River w/ New Large Patio-Gas Grill with Patio Furniture, WiFi, Cable, Washer/Dryer, Wood Burning Fireplace, Newly Remodeled- New Carpet! Arnold's River Retreat - On The River - WiFi - Cable - Washer/Dryer - Wood Stove - Fire Pit - Picnic Table - Walk to Town!